Nevada gets short shrift in comparison to its famous city, Las Vegas. The state offers much more than gambling and chorus girls, and during WWII stepped up to “do its bit” like the other U.S. states and territories. Mining was a major industry in Nevada well before the war began. However, as demand for copper, silver, and other important raw materials rose, mining companies expanded operations, hiring thousands of personnel who worked around the clock. In just two years production almost doubled when it rose to $43,864,107. One of Nevada’s most important contributions was magnesium. At its peak, the state mined five million pounds per day for a total or more than one hundred sixty six million ingots by war’s end, one-quarter of all magnesium used by the War Department for munitions casings and aircraft parts. As with other states in the West, Nevada’s weather, wide open spaces, railroad connections, and proximity to California made it an excellent location for training pilots. 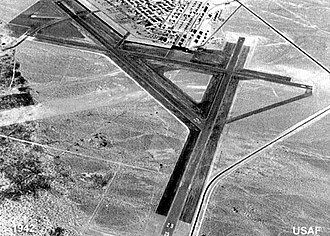 Four airfields (Reno, Tonopah, Indian Springs, and Las Vegas) became the major installations, but there were others throughout the state. Targets were set in the deserts so that B-17 and B-24 crews could prepare for missions. Six hundred gunnery and 215 co-pilots graduated every five weeks, and by the end of the war 45,000 gunners had completed training in Nevada, including those who were tasked with dropping the atomic bombs on Japan. Despite its remoteness from either coast, Nevada was not used as a site for the internment of Japanese or prisoners of war. Governor Edward Carville refused on the grounds that he didn’t not want his state used “as a dumping ground for enemy aliens.” The few enemy aliens who did reside in Nevada were faced with mixed response. Not all Japanese were forced to move to relocation camps, but many who stated were required to adhere to new restrictions and laws such as registering themselves and turning in all weapons and short-wave radios. Built between 1931 and 1936, Hoover Dam (formerly Boulder Dam) is located over the Colorado River on the border of Nevada and Arizona. A major provider of hydroelectricity for the defense factories in California, the facility was considered a vulnerable target. Government agencies monitored possible German and Japanese threats and precautions were taken to ensure its safety. 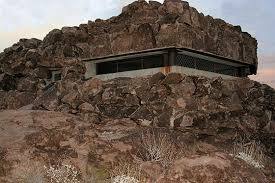 In addition to being protected by over eight hundred men from Camp Williston, access to the dam by visitors was restricted, and navigation on Lake Mead around the dam was prohibited. Men and women from around the state served in uniform with distinction, and nearly 600 soldier, sailors, and airmen lost their lives.